Steam cleaning is an efficient and wholesome way to clean and refresh soiled tiled floors and other hard surfaces around the home. And with a steamer, you will not be needing different cleaning machines for a good one can do the jobs of most others. Steaming does not require the use of toxic chemicals to clean and sanitize, you can save money using a reliable model. 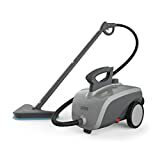 In our PureClean XL Rolling Steam Cleaner review, we report on a lightweight and compact canister-style unit that is easy to wheel about and use at home. This low-profile unit is popular among homeowners for tidying up high-traffic wet areas. Cleaning attachments will let you prepare it for almost any steaming job. Parents in particular like it for its ability to clean bath tiles and kitchen counters in ways that are safer for kids. Stains on tiled floors that are hard to clear with scrubbing are readily cleaned by forceful jets of steam. The method can require a bit of work, but it typically involves less expense and greater convenience than total flooring replacement. Steaming works well on laminate floorboards when applied carefully using mop accessories that are designed for the task. Such boards can withstand the chance spill, although the excess moisture that gets constantly deposited over time can damage their layered interiors. It is never a good to use commercial carpet steam cleaners for such jobs. Their highly-pressurized steam output can easily seep past the laminate edges and undermine the interior layers. Careful mopping with a regulated flow of steam is safest in such situations. Hard-surfaced floors are not the only things that steam can clean well, the method is good for bed bugs as well. These pests spread quickly and can be difficult to eradicate. Steam flowed at temperatures exceeding 200°F will kill bed bugs while simultaneously cleansing the affected areas. This low-profile canister model produces pressurized jets of vapor that exit the nozzle with temperatures beyond 200°F. The hot streams can dislodge and liquefy the majority of stains that grow on the grout between tiles in wet areas. You use the nozzle to direct the hot streams to wherever they are required. There is a switch next to the flow trigger that when pressed will engage continuous streaming. The buttons were easy to press and were predictable in operation. A hot stream was output that worked to clear out affected spots with little time wasted. The unit is of robust construction and weighs under 10 pounds. As with similarly compact designs, the canister base is easily wheeled into other rooms. Its 16-foot power cord has sufficient reach for most and the decent lengths of the hose and its extensions really help. A variety of accessories are included in addition to the mop head and jet nozzle. Included are a fabric mop pad, hose extension wands, a triangular corner brush, short and long nylon utility brushes, scrubbing pad, funnel, and squeegee. There were a few niggling issues with the design. For one, there is no water-level gauge to indicate how much water has been poured into the reservoir. The machine also does not signal once things are ready. We also noticed that the provided mop pad is not as thick or absorbent as that of other brands. Boiler parts tend to develop problems after time as a result of inconsistent assembly quality, so it makes sense to deal with reputable vendors offering extended warranties. That said, the five-year manufacturer’s warranty is outstanding and should be enough to provide peace of mind. You can do quite a few cleaning chores around the house with this steamer, such as working grease off stovetops and clearing stains and gunk off grout in tiled baths and kitchen counters. You can also refresh carpets with its large loads of steam. Once the tank was filled with water and the boiler switched on, the unit will be steaming and ready for action in less than a dozen minutes. An hour of steaming is not uncommon with this unit. The user only has to fill the tank to around three-fourths of its capacity, turn on power, then pause while pressure develops before triggering flow. One good feature is that it will take no more than 12 minutes after powering on before a continuous and steady flow of steam becomes available. This quick run from a cold start is something that most big units cannot compete with. Pulling the flow trigger a few times in the first few minutes will get water flowing and steaming eventually. It is best to start from low before raising output as necessary, then tailor the flow for different conditions as you go. A full load of water usually brings about 50 minutes of steam, which can be extended with deft use of the on-demand control. It is best not to top off the water reservoir, for overfilling it would not leave enough space for the pressurized vapors to expand into. A larger tank capacity would have therefore allowed for longer cleaning sessions between each refill. Things also have to cool off before the tank can be opened and refilled safely, after which you will have to wait some more for steaming to restart. Light steaming works well on lighter-colored walls and similar, while heavy steaming may need to be applied to challenging spots and encrusted gunk. Users need to be careful not to push hard along the fully stretched wand, as the manufacturer recommends. The relatively narrow hose extension cannot take on too much weight on it before giving way. This model gets a lot of favorable reviews and is readily available with free shipping at the major online sellers. It may not be the most powerful available, but this steamer is good at most household steaming tasks and is also nicer to use than most of its rivals. Large capacity. With lots of water on hand, more of your time can be used to clean things instead of attending to tank refills. Extended hose. The extra length along with the long power cord will allow you to reach the corners of most rooms. Flow-control switch. Continuous steaming can be readily set and released as required. Useful accessories. Attachments enable users to handle a range of cleaning tasks. Long cord. The 16-foot cord has enough length to reach most parts of larger rooms around the home. Handle organizer. The arrangement works nicely for securing the hose and moving the unit around. No water-level gauge or ready-for-use alert. Two-sided pads from other manufactures tend to be thicker as well as more absorbent.